What is your group working on? Optical telescopes allow us to see stars and galaxies many light years away, yet we struggle to see within matter right here at our fingertips. Our atmosphere is almost transparent, but when light interacts with thick biological tissue, light scattering leads to blurry, low-resolution images. You can see this effect if you put a flashlight against the palm of your hand – you cannot see through it, but you see a glow. My group uses a range of techniques to try to overcome this problem, including multi-photon microscopy, adaptive optics, computational imaging and optical engineering – technologies that can enable us to see deep inside living tissues without the blur. Adaptive optics, for instance, enables us to bend light rays so that they come together at one point to create a perfect focus – something that, for example, enables the imaging of individual cells or neurons deep in the brain. At the moment, we can probe to depths of around 500 micrometres inside a mouse brain and visualise its neuronal activity. But we want to go deeper, beyond the cortex, to study other important regions such as the hippocampus, which plays an important role in memory formation. We want to combine our methods in a way that could enable us to observe the real, much faster, electrical signal that neurons use to communicate with each other. What do you want to achieve at EMBL? My group is motivated to build imaging technology that helps to understand how the brain works, but also to enable novel studies on tumour growth. Normally, researchers will remove cancer tissue and look at it under the microscope. But this environment is very different to real, living tissue. We want to study this tissue in vivo and gain a better understanding of how cells behave inside the living mouse. Another goal is to increase the depth to which we can provide these images: this can be achieved not only through technological developments, but also by combining different imaging approaches. What has struck you since joining EMBL? Everyone I have met is open to collaboration. I have already travelled to EMBL’s Monterotondo site three times and I am excited to set up cross-site projects. 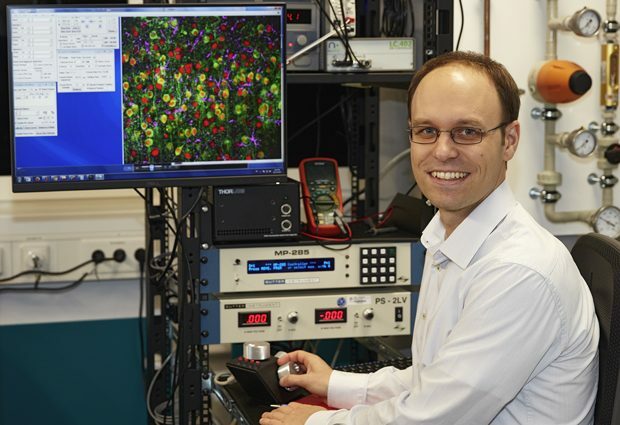 Paul Heppenstall, for example, is using molecular probes that enable imaging of neuronal activity at very high speed. At the moment it is only possible to observe neural signalling within networks indirectly, measuring calcium levels. We want to combine our methods in a way that could enable us to observe the real, much faster, electrical signal that neurons use to communicate with each other. I moved into biological imaging basically because I love light! We are developing technical microscopes, but at the same time we want to apply these technologies in a biological context straightaway. I am looking for physicists, engineers, but also biologists – in general people with interdisciplinary backgrounds that enable them to step out of their comfort zones and beyond the borders of their specific fields. I am also looking for team members with a potential to grow during their time in my group and ultimately become independent researchers. Tell me about your PhD thesis. I led a project on optical quantum computing in the group of Anton Zeilinger at the Vienna Centre for Quantum Science. Classic computers use bits, encoding information in a long string of 0s and 1s. But quantum computing enables you to encode and process much more information using the states in between. I studied how polarised, single photons can be used to process information much faster than conventional computers in this way. Anton is a visionary and a great thinker, who encouraged me to think on a fundamental level, an approach I strongly encourage in my group today. Why did you move into biological imaging? Basically because I love light! During my postdoc I started a project using quantum imaging: we generated single photon states to probe very simple biological samples with higher resolution – in our case we imaged onion skin. It worked well, but it was merely a proof of principle: I realised we cannot take these ideas and build a practical microscope at the moment. Biological imaging, however, is a field where my work could have a much more immediate impact. The connection of research to society has always been important to me: the microscopes developed by my team play a small, but hopefully important role in understanding questions of great relevance. …one of the reasons why it is so important to have interdisciplinarity in labs is to minimise mistakes and maximise creativity and learning. Can you recall a time when you have failed over the course of your career? Failure is part and parcel of science: most researchers fail on a regular basis. When I was working as a postdoc, I made the switch from quantum research to something more applied and practical – and biological! At first, I was struggling to understand the biology of some of the experiments and I was concerned I was making some very basic mistakes. This is one of the reasons why it is so important to have interdisciplinarity in labs – to minimise mistakes and maximise creativity and learning. Now that I am a group leader, there is not as much time to sit down and reflect on things! I have a family and a young baby at home – so there is very little free time for creative thinking. But sometimes I can take an hour or two in the early morning to myself, do sports and think. That’s when I am most creative these days. Which unsolved question would you most like to answer? What is the neural basis of consciousness? How and when does it arise and what’s the function of it? What field of science do you find the hardest to understand? Anything that involves a lot of pure mathematics – string theory for example! What advice do you have for young scientists that want to become group leaders themselves? Today, students tend to focus on specific fields and research questions very early on in their career. But it can help to think about the bigger picture. As a group leader, you eventually have to position the work of your group as part of the wider research mission of the institute – in this sense it is important to know your niche but also be aware of what others are doing around you so that you can plan your research the right way. When it comes to starting a group, you have to balance the challenge of getting a lab up and running with developing a vision for the future ­– which can be overwhelming at first. My advice is: don’t feel like you need to do everything at once and right away, because it’s not possible. Be focused, but take your time so you make sure you do everything in the best possible way.